In his recent article on “Oral History and IRBs,” E. Taylor Atkins applauds the argument of J. Michael Oakes “that IRBs should be viewed as—and should behave as—peer review systems rather than as unaccountable ‘leviathans’ exercising authority from on high.” But Oakes and Atkins overlook profound differences between IRB review and peer review. The two systems are not merely different; they are antithetical. The most obvious difference between peer review and IRB review is that peer review means review by peers—fellow scholars in one’s field. This was also the system envisioned in 1966 when the Public Health Service first mandated “prior review by [a researcher’s] institutional associates” before that researcher could received PHS funds, and to some degree it is the way IRB review works in biomedical research, where teams of physicians and other biomedical researchers review protocols by others in their field. But fundamental to the complaints of oral historians and others in the humanities and social sciences is the fact that IRBs are never (to my knowledge) composed mostly of scholars who conduct qualitative interviews. Indeed, most IRBs probably lack a single such researcher. Although historians have had no chance to shape the framework within which IRBs operate, by law and by their responsibility to their institutions, IRBs cannot ignore this framework. So it is not peer review at all that they impose, but values foreign to the historical profession. One result of this peerless system is that IRBs are rarely able to offer the kind of expert advice we seek in good peer review. I have reviewed many manuscripts myself, but only when editors sought me out among a national or international pool of scholars. As a result, every manuscript I have read concerned some aspect of urban planning, infrastructure, or transportation—areas to which I have devoted years of research—or was designed as a textbook for use in the kinds of courses I regularly teach. Yet, as I note in my posting, “In Search of Expertise,” IRBs rely not on such a broad pool, but on whomever happens to be on campus and willing to serve on the local IRB. Atkins also ignores the power of researchers to shape the peer review of their work. Certainly a university researcher who never submitted anything for peer review would be unlikely to win promotion, but Atkins forgets the choice researchers enjoy in deciding which peer-reviewed journal or press will receive their manuscripts, and which will be alternatives should the first choice reject the proposal. 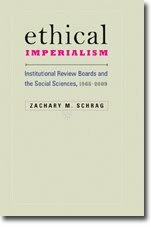 Comparable choosiness in ethical review is derided as “IRB shopping,” and university IRBs retain their monopolies (See Jeffrey Brainard, “Federal Agency Decides Not to Regulate 'IRB Shopping,'” Chronicle of Higher Education, 18 January 2006). Moreover, scholars and editors are free to ignore the advice of peer reviewers in preparing a final publication; how fondly I recall my first editor’s telling me not to worry about the difficult theory one reviewer wanted me to incorporate! Most importantly, scholars are always free to publish in non-peer-reviewed forums, such as this blog. In contrast, IRBs insist on the power to decide when a project requires their review. Atkins recently attended a PRIM&R conference and “was astounded by the persistent ignorance among IRB administrators and board members in attendance about the special needs of SBER and oral history.” He responded by blaming the victim: “If we refuse to teach IRBs, how can they learn what we need them to know?” What he refuses to acknowledge is that IRBs’ power frees them of any incentive to learn. A publisher whose peer-reviewers offered consistently bad advice would soon lack for material. An IRB can mistreat researchers yet suffer no loss of power; its decisions are final. While peer review is a persuasive effort by volunteers, IRB review is a coercive practice by agents of the state. Leviathans or not, IRBs do little but exercise authority from on high, empowered by federal regulations stating that “an IRB shall review and have authority to approve, require modifications in (to secure approval), or disapprove all research activities covered by [federal] policy,” and that no university official can overturn such decisions. Institutions that disobey this mandate risk losing millions of dollars in funds; individual researchers risk denial of degrees, promotion, or even the right to continue any research. Take away this coercive power, and perhaps historians will learn to respect IRBs. Until then, expect them to resist.